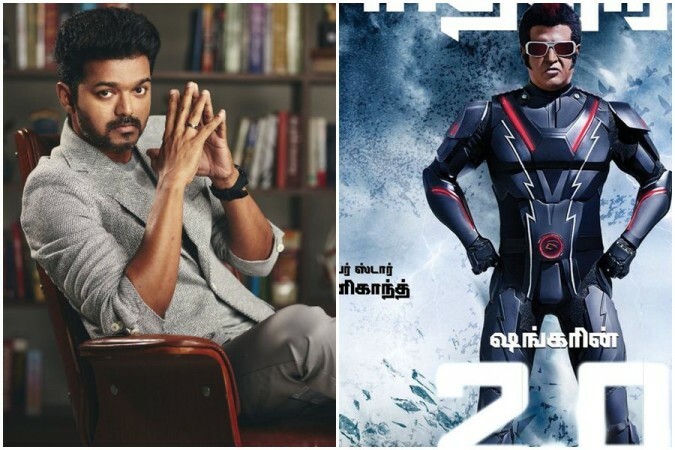 Here, we bring a comparison of 4-day box office collection of Rajinikanth's 2.0 vs Vijay's Sarkar in Chennai. Rajinikanth's 2.0 has done an excellent business at the Chennai box office in its first weekend. Indeed, the Kollywood film has made a better collection than the recent hit movie Vijay's Sarkar in the capital city of Tamil Nadu. On the opening day, 2.0 did Rs 2.64 crore to become the biggest opener of all-time in Chennai. It shattered the record of Sarkar, which had earned Rs 2.41 crore on the opening day. However, there was a belief among the trade experts that the 3D glass charges collected by the exhibitors for the Rajini's flick helped it to beat the record of Vijay's Diwali release. On the second day, 2.0 made a collection of Rs 2.13 crore, which is lesser than Sarkar's second-day business of Rs 2.32 crore. Although the total collection of the Rajini's flick was slightly higher, there were fears among the distributors that the latest flick might fail to attract the audience, drastically. However, what followed next took everybody by a surprise. On its third day, 2.0 earned Rs 2.57 crore, which was double the amount of Sarkar's third-day business of Rs 1.28 crore. On its fourth day, the Rajinikanth-starrer registered its best performance as the movie minted Rs 2.75 crore to end its first weekend at Rs 10.09 crore. On the other side, Sarkar had raked in Rs 1.36 crore to take its four-day collection to Rs 7.37 crore. Sarkar was released on a working day (Tuesday) although it had the advantage of Diwali holiday season. The fifth and sixth day (Saturday and Sunday) collections of AR Murugadoss' film were higher than its third and fourth day. So, it has to be seen whether 2.0 outperforms Sarkar in the next two days. As of now, 2.0 is way ahead of Sarkar at the Chennai box office. The Shankar's creation, which has Amy Jackson playing the female lead, has grossed over Rs 50 crore in four days. The movie witnessed the highest occupancy in many centres on Sunday and the response from the family audience is good. However, it should do exceedingly well in the next few days to enter the profit zone.